Several years ago, as part of Library Thing's early review program, I was delighted to receive an advance copy of Judith Tarr's book, "Writing Horses: The Fine Art of Getting it Right." Judith Tarr is a popular fantasy writer, who also happens to breed and train Lipizzan horses on her farm in Arizona. I quite enjoyed her book about writing horses, and have reproduced my original review at the end of this post. In what I imagine to be her copious amounts of spare time, Judith also sometimes posts about horses on the Book View Cafe blog. I always enjoy her posts, which combine level-headed practicality with a fierce love for these simultaneously powerful and fragile creatures. A recent offering, "Why Do You Have Him If You Can't Ride Him," came at a timely moment for me. My horse, Morocha, was a 25 year-old former polo pony who had been slowing down for some time, though we were able to ride a bit up until just before this last Christmas. A tough athletic life (up until her cushy retirement 9 years ago with me!) took its toll, contributing to arthritis and degenerating tendons. It quickly became clear that not only were her riding days over, she wouldn't regain enough mobility to be safely turned out in pasture. What good is an unridable horse to anyone? Judith makes some excellent suggestions, including "walking partner," "confident," and "inspiration." I would add, "carrot consumer," "mane and tail braiding practice partner" and "photographer's model." Sadly we had far too little time to enjoy these pursuits, but I treasured every moment of walking, grazing, and enjoying the sunsets over the ocean. As for fictional horses in novels, I really appreciate it when writers get it right. While horses in a historical or fantasy setting don't need to figure in as anything other than transportation, they can provide so much more. How a character interacts with horses and other animals is very telling. For example, one of my favorite historical mystery series is C.J. Sansom's Matthew Shardlake novels. The central character, mystery-solving Tudor-era lawyer Shardlake, is neither young nor athletic. He is not a particularly confident rider, but since riding horses was the only way to travel quickly overland in Tudor England, he often needs to ride fast and far. While I probably wouldn't have noticed if horses remained in the background, I was touched by Shardlake's genuine grief at the loss of his favorite old gelding -- a horse that had carried him safely and willingly for many years. Even if others thought him a bit odd for caring, he wasn't ashamed to feel sad at the loss of a faithful companion. He goes on to struggle a bit getting comfortable with his much younger and flightier new mount, but as they get to know each other they do form a bond -- as people and horses have been doing through the centuries. “Horses are not dogs” is the title of the introduction to Judith Tarr’s “Writing Horses.” A simple statement, but an important take-home message from this book. Unlike dogs and cats, who are the small and affectionate descendants of predators, horses are prey animals. 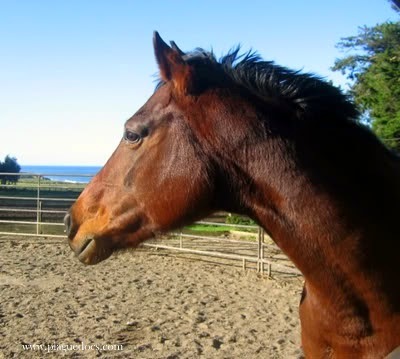 Understanding that simple fact explains a lot about horse behavior. The author is a knowledgeable horse woman and her Lipizzaners are absolutely stunning. There are many pictures in the book, and they alone are worth the price of admission! “Writing Horses provides a great reference for the writer who is not intimately familiar with horses. There are chapters covering every aspect from the terminology of coat colors, to tack (the saddle and bridle) for different riding disciplines, to grooming, horse care, and breeding. There is information that will help you plan a realistic trip on horseback for your fictional characters – a critical part of many works of fantasy or historical fiction. My only complaint about the book would be in using the hyperlinks in different e-book formats. I ended up working with this book in several formats. First I read it in the mobi-pocket version, on my aging Palm TX. My TX has color, and is wifi enabled, so the pictures looked great and the links actually worked (if fiddly) if I was in range. More recently, I acquired a Kindle, and have loaded “Writing Horses” in two versions: the unconverted pdf, and the pdf as converted by Amazon for the Kindle. The conversion allows Kindle’s functionality to work (changing font size, text-to-speech), though it does alter the appearance of the text itself. Unfortunately, the links don’t work, even though my Kindle is both wifi and 3G enabled. So, the only book format in which I was able to get full functionality of the links was reading it on my computer screen in pdf format. Not ideal, in my opinion. I think it would have been a better choice to use pictures for illustrating discussions of issues such as coat color and anatomy. Links to studies and the like could be in an appendix at the end, where the reader could explore at leisure. Science Friday's Book Club read for January 2015 is David Grann's book, "The Lost City of Z." Those of you lucky enough to be in the New York City area can get a ticket to join Sci Fri's live discussion of the book with the author at The Explorer's Club in Manhattan. The event is scheduled for February 5, and tickets are only $20. Wish I could be there! I don't know why, because I'm not particularly adventuresome, but I'm a sucker for stories of exploration. Lewis and Clark, Drake's circumnavigation of the globe, Shackleton, Stanley and Livingstone -- I love books and films about all of them and their ilk. I've read "River of Doubt," about Theodore Roosevelt's Amazon journey, and enjoyed Werner Herzog's film "Aguirre, the Wrath of God." From the latter two vicarious adventures, I learned a healthy respect for the lethality of Amazon exploration, but I had never heard of Fawsett or his efforts to explore and map the Amazon basin. "The Lost City of Z" tells the story of Amazon Explorer Percy Fawsett, starting with his background and following his career up until the disappearance of his entire expedition during a 1925 attempt to locate the site of a fabled ancient civilization. Fawsett's story is interwoven with that of author David Grann's quest to trace Fawsett's path as well as tell the tales of other rescue missions -- which also had a tendency to disappear never to be seen again. I haven't finished the book yet, but I've been quite enjoying it and would recommend it to anyone interested in the history of exploration, or intrigued by the story of a real life "Indiana Jones." The tale of an expedition lost while seeking a mythical landmark has Amazonian parallels to Franklin's lost voyage to find the Northwest Passage -- a disappearance which also defied many attempts to discover the voyagers' fate until just recently. Since I don't yet know whether Grann met with any success in finding Fawsett's remains -- though clearly he made it home to write the book! -- I may skip tomorrow's broadcast until I've finished. It will be podcast and available "within 3 hours after it airs."